Jodi Siegel & Alfred and Friends 7:30~10:30 p.m.
Wendy's much-anticipated follow-up CD "MORE" has been doing great! The first reactions were better than ever!! Here's one -- "God, I love this CD! You know some CDs you like several of the cuts, or a couple, or one. I like every song. It's beautiful! Hit Songs -- #1, #3, #4, #7, #9!" -- Marilyn B. "Excellent album!" - Rik James - KGLT, Bozeman, MT. "What a great sound - country/Americana - whatever they want to call it - it kicks!" - Laney Goodman - WUMB, "Women in Music with Laney Goodman" Boston, MA. "A great voice...nicely produced." - Otto Bost - WDIY, Allentown, PA.
"'Ghosts That Aren't Mine', packaged in rock & roll, was indeed a pleasant surprise for this folk DJ." - Amy Jeffries - WTRC, Hartford, CT.
A San Francisco, California native, Wendy Conrad and her family spent a good part of her youth moving - first from San Francisco, across country to Chicago; then back to San Francisco, and again across country to Pennsylvania; then turn around to San Francisco, and again across country, this time for nine years to a rural suburb outside of D.C. -- Rockville, Maryland. After which, it was back across country to Southern California -- first San Diego, then all over Los Angeles, and now El Segundo -- where, aside from 1-1/2 years in Nashville, TN, she has lived since. Wendy found that she thrived on the distinct change of season and/or scenery that marked each move, along with the distinctly varied circumstances and eclectic mixes of people from all walks of life...all influences that have found their way into the songs she writes and plays on guitar. It was shortly after the L.A. riots in 1992 that, with encouragement from a close friend, Wendy took the challenge to see if she could compose music, at first just to set some of her poetry and lyrics to. She'd been writing both since childhood and, though she'd convinced herself she couldn't write music, was surprised to discover writing music was something that came naturally to her. And so in the summer of 1993, desperately needing a change of scenery, she packed up her car with her two cats, guitar and her 3-song demo, and drove across country to Nashville, TN. It was during her next year-and-a-half living there that she wrote numerous songs, recording them on her 8-track Tascam recorder, then making cold-calls, actually getting meetings with some of the top publishers in Nashville. And they encouraged her to keep writing, telling her she was on the right track. So she set her sights on learning all she could about the craft, anything to help herself write better songs, and hit showcase after showcase to hear some of the best singer-songerwriters out there, always meeting other songwriters along the way doing the same. In the fall of 1994, Wendy relocated from Nashville, TN back to the L.A. area where she kept writing new songs. And she took a performance class to help herself overcome her stage fright, as she was beginning to perform regularly at premiere songwriter showcases in L.A. at venues including Highland Grounds, Luna Park, Borders Books & Music, Hallenbeck's, and Genghis Cohen, sharing the bill with such artists as Spencer Davis, Teresa James, and Dillon O'Brien. The future may have taken several years to get to, but Wendy Conrad is back with "More", a collection of 10 original songs she wrote, drawing on life experiences that are sure to find universal appeal. 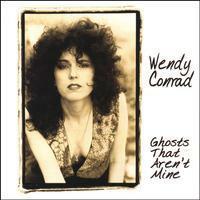 After an intial listen or two of Wendy Conrad's debut release, the stunning GHOSTS THAT AREN'T MINE, you might catch yourself thinking "Man, Alison Krauss could do a great version of this song!" or "This would be a perfect track for the Dixie Chicks!" However, it's to the listener's benefit that Conrad has instead chosen to keep these songs for herself, resulting in a debut effort of absolutely authoritative country/folk rock. Anchored by a powerful acoustic vibe, the disc is a hypnotically soothing blend of heartfelt lyrics (full of insightful and universal ruminations), understated, yet intelligent, arrangements and powerful, crystalline vocals. Highlights include "2 Doors Down", a wry ode to a multi-million dollar jackpot notification that ended up in the wrong mailbox ("And even though I'm happy for the luck that they found/I wish it was me who got that letter/2 doors down") that sparkles as it sails along, the powerful "Murphy Has A Law", which reminds us that, no matter how dark things may get, there truly is light right around the corner, and "The Hunger", an aching flamenco-tinged piece of heartache, regret and resignation. Things wrap up with the sad, yet strong, "I Can't Go Back" ("Still in my darkest hour/I go diggin'/Where I buried the bones/Old familiar habits/But all I find beneath the dirt are stones"). So check out Wendy Conrad's GHOSTS THAT AREN'T MINE, a powerful debut of uncommon depth and beauty.